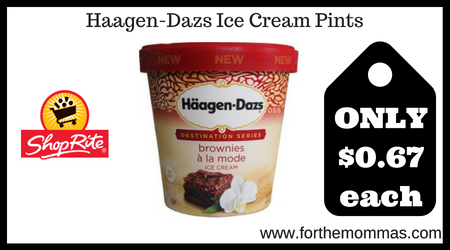 ShopRite: Haagen-Dazs Ice Cream Pints ONLY $0.67 Each Thru 8/18! This week thru 8/18, ShopRite has Haagen-Dazs Ice Cream Pints priced at only $2.88 each. In addition to this, we have a ShopRite super coupon & a $2/3 Nestle, Haagen-Dazs or Outshine products printable coupon. Stack it with a ShopRite ecoupon that will make your final price ONLY $0.67 each! Note: ShopRite super coupons are regional and all areas may not receive the same coupons.